Dave explained: "The weekend was full of emotion. Having got a really good wet setting in the Friday test day I felt as though I was ready to take anything the weather decided to throw at me. In the first afternoon session however I fell victim, as did two others, to some oil on the circuit at Hall Bends and it had me off and over the bars so quickly. I genuinely didn't know I had crashed until I was looking at the bike from up in the air! "It was a slow crash as it was my out lap and I had only got to the 2nd corner! The problem with the slow crashes is that you usually go straight up and straight down. Speed is your friend sometimes in a crash as you glance the ground rather than hitting it like a ton of bricks! I cracked a rib and destroyed a helmet and we had to quickly fix the bike in order to get one last shakedown session on the Friday before we went straight into qualifying on Saturday morning. "Phil, my trusted mechanic, did a great job of getting the bike sorted and I got out for the last session and confirmed all was OK with the bike. 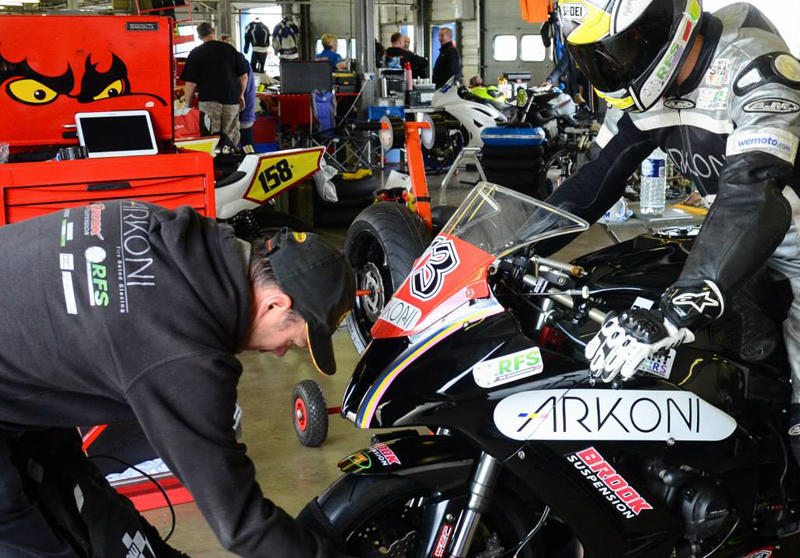 "The rain had gone by Saturday morning and I qualified third in Superstock. I was satisfied with that as the rib was giving me some grief during fast direction change corners. I got a bit of a poor start in the first race which prevented me from hanging on to the pole man which was Sam Hornsey. I rode a solid race and brought it home where I started in 3rd. The laps were very consistent too which is always good. "I had made some changes to the bike between the race and qualifying which had some positive effects and some negatives. I had another couple of changes to make for the first race on Sunday but unfortunately it wasn't meant to be. My oil cooler had failed and we couldn't get the parts track side. I was really disappointed but what can you do besides run a spare bike? "That's racing!" concluded "Brooky" whose next race meeting is at Oulton Park in a months time. For more details visit www.brooky73.co.uk and arkoni.co.uk.